Calling all entrepreneurs located in or interested in doing business in Blount County. 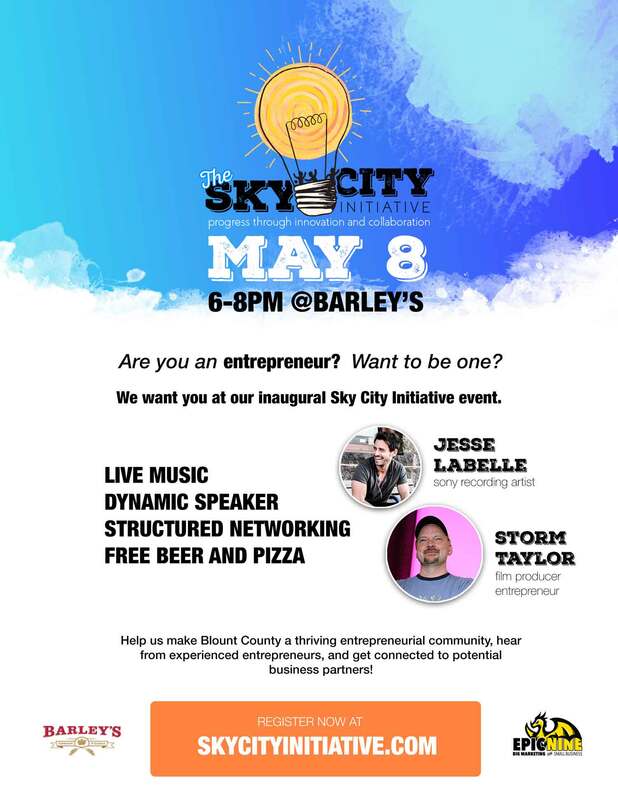 Organizers of the new “Sky City Initiative” are planning the first in a series of regular events to help accelerate a culture of entrepreneurship in the community. The inaugural meet-up is set for 6 to 8 p.m. May 8 at Barley’s Taproom, 128 West Broadway in Maryville. You can click here to register. The flyer is at the end of this post. The grassroots effort is led by local business owners and entrepreneurs and supported by representatives from several key community-focused organizations. The latter group includes the Blount Partnership, Blount County Public Library, and Maryville College. The members have been meeting on an almost weekly basis since the first of the year to explore ways to support individuals who want to start a business or grow an existing one in the county. They have decided the best starting point is to learn the needs of entrepreneurs and help build a community-wide network of aspiring entrepreneurs. 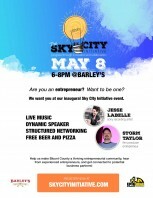 What better way to launch the “Sky City Initiative” that than a meet-up featuring music, pizza, beer and a passionate local entrepreneur? For the May 8 event, they’ve lined-up a successful Blount County native who recently returned to the community to open his own business and a Canadian-born country music artist who now calls Nashville home. The recently returned native is Storm Taylor, best known for his role in producing The Wild and Wonderful Whites of West Virginia documentary. He will speak about his entrepreneurial experiences including Saint Taylor’s Public House, an upscale pub and bar he just opened in the downtown area. Jesse Labelle is the singer-songwriter who was chosen to open for Keith Urban on the “Raise ‘Em Up Tour.” You can learn more about him by reading this recent article from Nash In Tune. Implement solutions – work to address the obstacles and needs that entrepreneurs have. In addition to Laduke, other members of the organizing team include Rachel Buchanan and Claire Carter, Blount Partnership; Kenneth Herring, Cirrus Insight; Bob Hirche, International Center for Minimal Access Surgery Inc. and also the Downtown Maryville Association; Christy McDonald, Maryville College; Renee Ritchie, Feed the Orphans; Lane Shuler, LeConte Realty; K.C. Williams, Blount County Public Library; and yours truly.